The United Way Laurence E. Richardson Day of Caring is a day of service in the greater Charlottesville, Virginia area in the fall when thousands of volunteers from local companies and organizations make a difference at local nonprofits and public schools, and in the lives of students and clients by completing much-needed projects. If you are not in the Charlottesville, Virginia area, please contact the United Way in your area. When is the Day of Caring? 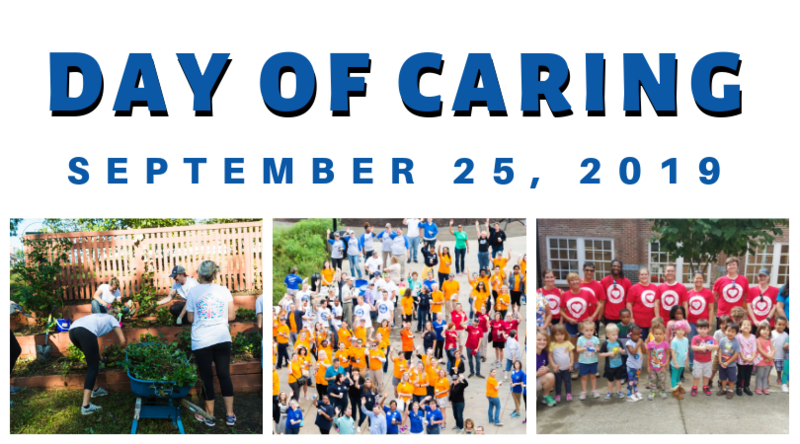 Day of Caring is typically the third Wednesday of September every year. The next Day of Caring is on Wednesday, September 25, 2019. How do we sign up to participate in the Day of Caring? Agencies can submit projects and volunteer teams can register online beginning on June 10, 2019. If you would like to be added to our notification list, email Anna Porter, Community Outreach Coordinator. What is the Kickoff Breakfast? The kickoff breakfast is an opportunity for all of the volunteers, agency representatives and sponsors to fill up on great food, meet up with your volunteer team or agency representative and receive a fabulous send-off from United Way staff and volunteers. What do we do if it rains on the Day of Caring? There is no “official” rain date for the Day of Caring because many projects will take place indoors and will go on, rain or shine. The Rally will go on if a light rain occurs and will cancel in a downpour. However, if a project is weather-dependent, the agency and volunteer team should work out a rain plan. Pre-determine an alternate day to complete the project, and determine how you will get the word out to all volunteers that the project has been rescheduled. What kinds of projects can we get involved with? The Day of Caring includes projects to suit many interests and abilities, from trail clearing to career counseling to clerical work to painting playgrounds or classrooms- and much more. How much of a time commitment is it to coordinate a volunteer team? Coordinating a volunteer team takes different amounts of time depending on how many volunteers will be participating and how you communicate with your team. Volunteer Team Leaders will spend time determining how many employees would like to participate and in what kind of project, submitting necessary forms to the United Way, attending a one-hour meeting on either August 6th or 8th, 2019, working out details with the agency project coordinator and communicating those details to the volunteer team. E-mail and web access will greatly reduce the amount of time spent coordinating a team. What is the agency expected to provide? It is expected that the agency will provide all major supplies and tools necessary to do the project. It is up to the agency to seek donations of supplies and tools, if necessary. Agencies should try to provide lunch, snacks, drinks and water, especially for volunteers at all-day projects. In addition, agencies should add special event volunteers to their insurance policy.